Early adopters recognized what these systems could offer; now benefits including overall water use reduction, better water and resource use efficiency (WUE and RUE), and greater yields have been proven in research and case studies from leading irrigation companies. Even with the proven benefits, many growers struggle with the idea of moving away from traditional irrigation practices to something unfamiliar. How much will the conversion cost? What kind of return can I expect? Will this affect the number of cuttings each year? And perhaps one of the biggest questions: How to best manage drip irrigation rodent control? Rodents are a concern for all alfalfa growers, regardless of what irrigation method is used. 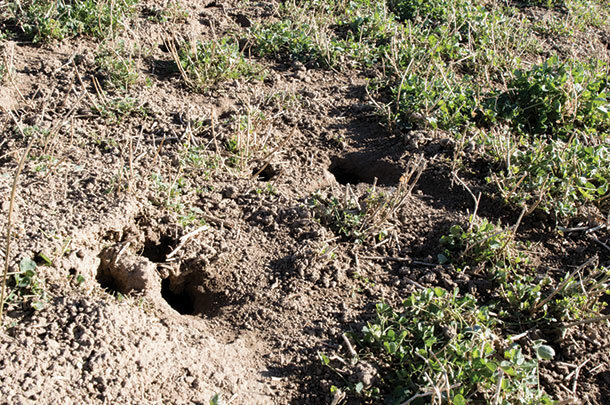 Pests like mice, voles and gophers cause yield loss and crop damage when not properly managed. Gophers are especially concerning for those who operate drip and SDI systems, as irrigation lines often become a victim of their common chewing and gnawing, damaging the entire irrigation system in addition to the crop. However, drip and SDI systems have several unique aspects and natural defenses for efficient and effective rodent management. Because there is no one “magic” solution for controlling pests, those looking to employ a drip or SDI system and successfully manage rodents need to build an integrated plan; one that begins before a drip or SDI system goes into the ground, continues throughout growing seasons and even includes post-cutting strategies. The first line of defense in the war on rodents is to identify areas of high rodent concentration, not only in the proposed drip or SDI field, but in surrounding areas as well. Create a buffer zone surrounding the field by eliminating weeds, ground cover and litter. Consider applying rodenticides in the buffer zone, especially if rodent pressures are high. Deep rip the soil to destroy burrows and disrupt the gopher’s habitat needed for survival (Note: excludes minimum tillage operations). During dripline installation, a repellant or toxicant can be applied, per state regulations. To reduce pathways for rodents, the shank slit can be packed with tractor tires. Finally, consider a low-cost biological line of defense – for example, owl boxes. As stated earlier, poisons and chemical controls are effective, but growers looking to reduce or eliminate the use of them can succeed with a plan that includes baiting, trapping and system-specific defense. One of the more labor-intensive strategies, trapping is also one of the most effective against all types of rodents. Keep in mind that rodents, especially gophers, are most active in the spring and fall. Traps will be most effective during these times, so prioritize time and labor to properly execute this strategy. Bait for a week, then set traps after bait has been continually taken. Traps can be baited with toxic anti-coagulant. For poison-free operations, traps baited with peanut butter, oatmeal or apples work well, especially for voles and meadow mice. For best success, gopher traps must be set on both tunnel entrances. Set out traps then check back within 48 hours. Any traps not visited within 48 hours should be moved and tested in a new location. Drip and SDI systems keep continuous levels of moisture in the soil, unlike flood irrigation that puts the soil through cycles of very wet versus very dry conditions or buy cialis online. This type of environment is unfavorable to rodents and they tend to avoid wet areas, making drip and SDI systems a natural repellant. Flood irrigation offers a natural rodent control strategy in drowning out gophers when a field is flooded, which is why some experts suggest growers with drip and SDI fields still retain the ability to flood irrigate as part of an integrated rodent management strategy. Additionally, some drip and SDI manufacturers are taking an active approach to address drip irrigation rodent control within the drip or SDI system itself. For instance, a product has been developed that when injected into the dripline, irritates rodents and drives them to the surface where they’re more vulnerable to predators. Check local and state regulations and product labels prior to use of this product. The biggest advantage with aluminum phosphides is the efficacy, with 85 to 100 percent efficacy common in burrow systems. Use of carbon monoxide-producing machines, while not as high in efficacy, can treat up to six burrow systems at once, making it a very fast and labor-reducing option. Burrow fumigants require relatively high soil moisture to work well. As mentioned earlier, drip and SDI systems maintain constant and high levels of moisture in the soil, making burrow fumigants naturally more effective in these systems. With any type of fumigant, it’s suggested to protect an entire field edge with burrow builders, paying attention to riparian areas, ditch banks and fields adjacent to the primary growth areas. After every cutting, closely monitor the area for any burrowing activity and take immediate action if needed. When it’s time to rotate the field to another crop, a best practice is to rotate in a cover crop. Beans, legumes or other cover crops should be planted to enrich the soil and provide good organic matter. As mentioned earlier, healthy soils are one of the best natural defenses to rodent and insect infestations. Furthermore, cover crops provide distraction for pests that would otherwise infiltrate profitable crops in adjacent fields. With proper planning and ongoing best management practices, rodent threats can be minimized in drip or SDI systems, leaving alfalfa growers to enjoy benefits of higher yields and greater WUE and RUE. No matter what course of action you take for your operation, here’s one final piece of advice: Don’t be afraid to proactively seek out additional information. Look to fellow growers who actively operate drip or SDI systems, as well as pest management experts and local extension agents, and use that knowledge as power for your operation. This entry was posted in Drip Irrigation News and tagged drip irrigation on alfalfa, drip irrigation system, rodent, rodent control, rodent damage, SDI, sdi system, subsurface drip irrigation. Bookmark the permalink. In your article, you stated that rodents are a concern for all alfalfa growers, regardless of what irrigation method is used and pests like mice, voles and gophers cause yield loss and crop damage when not properly managed. When I came home from work last night I found a lot of mice running around our front yard. I wonder if most pest control companies offer rodent control options.